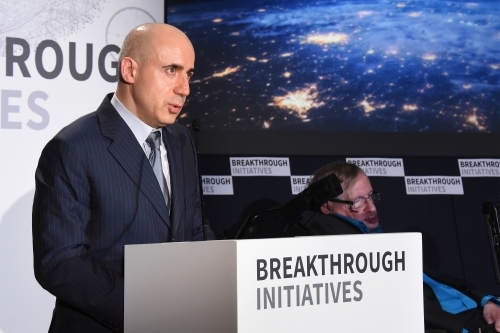 SETI received a much needed boost this morning as Russian entrepreneur Yuri Milner, along with physicist Stephen Hawking and a panel including Frank Drake, Ann Druyan, Martin Rees and Geoff Marcy announced a $100 million pair of initiatives to reinvigorate the search. The first of these, Breakthrough Listen, dramatically upgrades existing search methods, while Breakthrough Message will fund an international competition to create the kind of messages we might one day send to other stars, although the intention is also to provoke the necessary discussion and debate to decide the question of whether such messages should be sent in the first place. With $100 million to work with, SETI suddenly finds itself newly affluent, with significant access to two of the worlds largest telescopes  the 100-meter Green Bank instrument in West Virginia and the 64-meter Parkes Telescope in New South Wales. The funding will also allow the Automated Planet Finder at Lick Observatory to search at optical wavelengths. Milners Breakthrough Prize Foundation is behind the effort through its Breakthrough Initiatives division, a further indication of the high-tech investors passion for science. Image: Internet investor Yuri Milner announcing the Breakthrough Listen and Breakthrough Message initiatives in London at The Royal Society. Credit: Breakthrough Prize Foundation. Organizers explained that the search will be fifty times more sensitive than previous programs dedicated to SETI, and will cover ten times more of the sky than earlier efforts, scanning five times more of the radio spectrum 100 times faster than ever before. Covering a span of ten years, the plan is to survey the one million stars closest to the Earth, as well as to scan the center of the Milky Way and the entire galactic plane. Beyond the Milky Way, Breakthrough Listen will look for messages from the nearest 100 galaxies. According to the news release from Breakthrough Initiatives, if a civilization based around one of the thousand nearest stars transmits to us with the power of the aircraft radar we use today, we should be able to detect it. A civilization transmitting from the center of the Milky Way with anything more than twelve times the output of todays interplanetary radars should also be detectable. At optical wavelengths, a laser signal from a nearby star even at the 100-watt level is likewise detectable. Image: Martin Rees, Frank Drake, Ann Druyan and Geoff Marcy at the announcement. Credit: Breakthrough Prize Foundation. Geoff Marcy (UC-Berkeley) pointed out that we simply have no idea whether the nearest civilization is ten light years or 10 million light years away, but the Breakthrough Listen project will attempt to find out by scanning 10 billion frequencies simultaneously. Milner spoke of bringing a Silicon Valley approach to SETI, one that will develop its own software tools using open source methods and maintaining open databases. Organizers estimate that what Breakthrough Listen generates will amount to the largest amount of scientific data ever made available to the public. Thanks to its open source nature, the software effort will be flexible enough to allow scientists and members of the public to use it and to develop their own applications for data analysis. As part of the crowdsourced aspect of Breakthrough Listen, Milner announced that the effort will join the SETI@home project at UC-Berkeley, in which nine million volunteers donate spare computing power to assist in the SETI search. Martin Rees, Astronomer Royal, Fellow of Trinity College; Emeritus Professor of Cosmology and Astrophysics, University of Cambridge. Pete Worden, Chairman, Breakthrough Prize Foundation. Frank Drake, Chairman Emeritus, SETI Institute; Professor Emeritus of Astronomy and Astrophysics, University of California, Santa Cruz; Founding Director, National Astronomy and Ionosphere Center; Former Goldwin Smith Professor of Astronomy, Cornell University. Geoff Marcy, Professor of Astronomy, University of California, Berkeley; Alberts SETI Chair. Ann Druyan, Creative Director of the Interstellar Message, NASA Voyager; Co-Founder and CEO, Cosmos Studios; Emmy and Peabody award winning Writer and Producer. Dan Werthimer, Co-founder and chief scientist of the SETI@home project; director of SERENDIP; principal investigator for CASPER. Andrew Siemion, Director, Berkeley SETI Research Center. 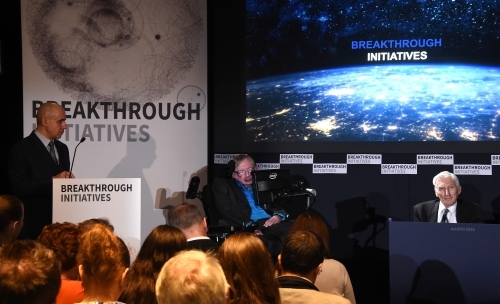 Image: Stephen Hawking addressing the audience at the Breakthrough Initiatives announcement. Credit: Breakthrough Prize Foundation. The news of these two Breakthrough Initiatives comes on July 20, the day humans first landed on the Moon in 1969. Hawking noted the scope of the challenge. We already know that potentially habitable planets are plentiful, and that organic molecules are common in the universe. Intelligence remains the great unknown. While it took 500 million years for life to evolve on Earth, it took two and a half billion years to get to multicelled animals, and technological civilization has appeared only once on our planet. Is intelligent life, then, rare? And if it exists, is it as fragile and as prone to self-destruction as we ourselves? Spending $100M not just to listen but to potentially message as well. Personally, I think messaging aliens has equal budgetary standing in these "Breakthrough Initiatives," else why would Breakthrough Message be given equal billing with Breakthrough Listen? You're not going to spend $50M studying whether or not a message should be sent. Actually sending one? Yes. Better to just listen for a long time. How far have our radio signals traveled from earth in the last 100 years? The distances are much too great for any conventional signals to be useful in any way. Until we can move above the space/time dimension it is pointless. Better to quietly listen ans learn before speaking up. If they’re out there, why would they want to talk to us? They’d probably view us a primitive, dangerous, and of no interest. See that little blue-green dot? 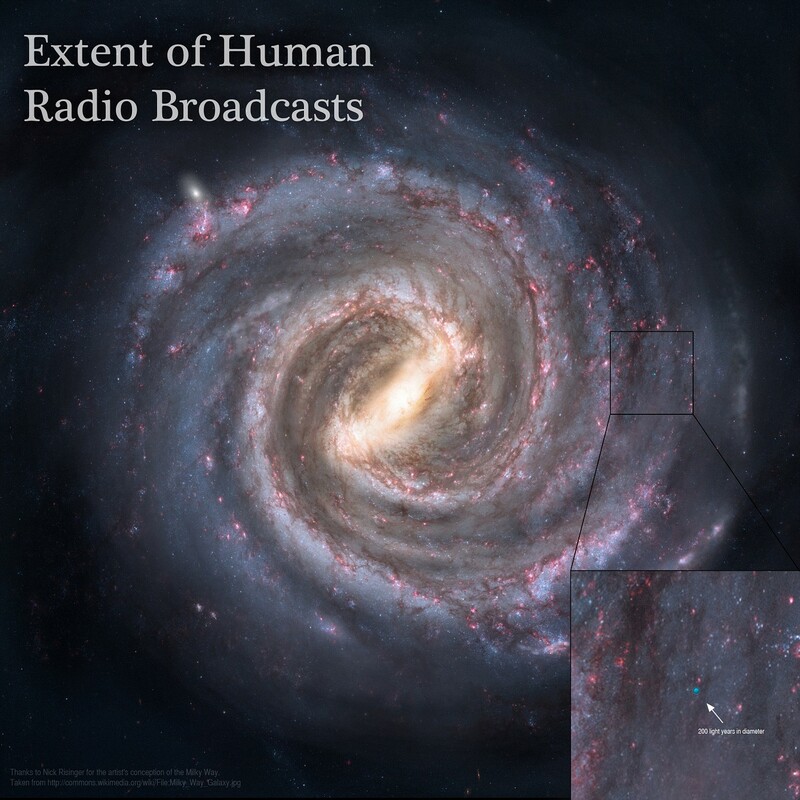 That's how far out into the galaxy our radio broadcasts have gone in the last 100 years.